Papier Mache describes itself as “a very cute childrens magazine for anyone who wants to read it”. And, oh my goodness, is it ever cute! Have you read it yet? Some of my favourite artists are featured or contributing this month: Barbara Berrada, Poala Zakimi, Elisabeth Dunker, Donna Wilson, Atsuko Ishii, Herzensart, Le Train Fantome, Lemmikkiapina and I am in there somewhere too! 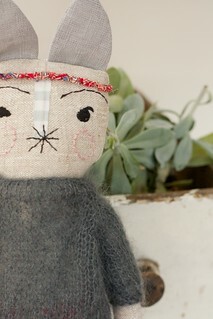 Hop on over to Papier Mache, it is so beautifully produced and styled, you won’t be sorry you did. This entry was posted in Lou Lou & Oscar Elsewhere and tagged "lou lou and oscar", atsuko ishii, barbara Berrada, donna wilson, elisabeth dunker, herzensart, Le Train Fantome, Lemmikkiapina, papier mache magazine, poala zakimi. Bookmark the permalink. Yes yes ! Congrats, love ! And on the cover, can you spot this aceness brooch ? It’s by the ever sweet and over-talented Misako Mimoko. congratulations Lisa!! this is wonderful! papier mache is so cute!